tomorrow. 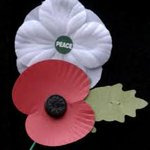 The WHITE Poppy is for World Peace now. YES Scotland is The REAL UK=OK! Since 1603 8 visitors (62 hits) to YES Scotland REAL UK=OK!